Effectively managing your global message and allow local content editors to adapt and extend that message to incorporate cultural differences and local messages. This will maximize your impact on local markets and still keep the costs manageable. It enables reuse of web applications, cms templating and web design, for each sub site you create. This shortens the time to market for a new website considerably. A good example is the Equens Merger where 6 websites were created in record time. Content can be reused over different websites and channels. There are however some limitations to reusing content in Tridion which need to be considered when creating a Tridion blueprint (todo write about limitations). 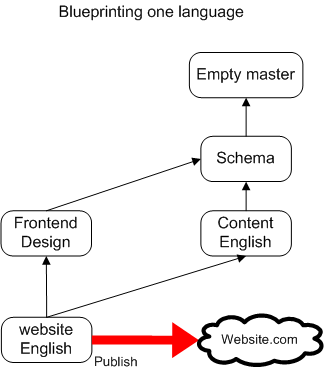 In my previous article I showed an elementary blueprint which contained only one language and one website. The picture below shows what the blueprint will look like when an additional language is added. As you can see I added two more publications to the blueprint. 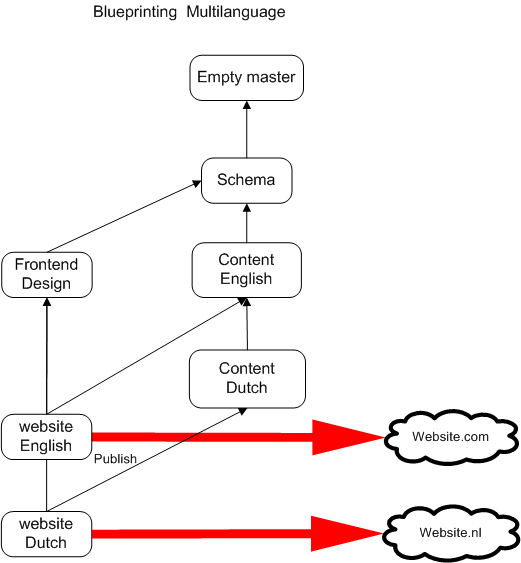 The first, “Content Dutch”, inherits from the “Content English” publication. In fact the Dutch publication contains an exact copy of the English content. The next step should be the translation of the content to the Dutch language and the addition of e.g the Dutch contact information for your organization. The second publication inherits from the “Frontend Design” publication which contains all the styles and templates which are already used in the English website. In it also inherits the Dutch content and thus forms the Dutch website. As you can see the only substantial effort, for creating a website in a new language, is in translating the content. Even this process can be automated by using the Tridion translation manager. After the content is translated it can be easily maintained by using the work flow capabilities of Tridion. 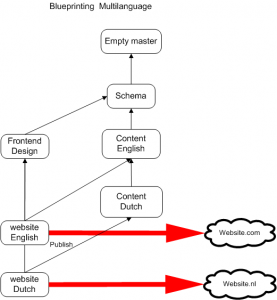 The advantage of inheriting templating and design is that future changes to the English website will automatically be implemented into the Dutch website. No more copies and different versions of your website just one brand and one message tailored for the local audience. The ability to effectively manage multilingual websites is the true strength of Tridion. It is in fact the sole reason why Tridion was created. I use this strucktur. but how can I switch between the languages ​​so that I stay in the same page. I translated my page title, so I have a problem with switching between languages. @mario If you want to switch languages on the same page I hope you chose dynamic content publishing. Otherwise it will be difficult. However I would advise you to also switch pages as reusing the same url for different languages will adversely affect your SEO. That said you could display the translated Component Presentation and request it from the content broker by sending the correct Publication ID param. Assuming it is the same page in different languages (publications) you could make an easy language switch by using the page URI instead. (or component ID). And if it doesn’t resolve, you can have it redirect to default starting point (homepage in other language) instead.